The Uruk-hai are the large soldier orcs of Mordor and Isengard in the Lord of the Rings movies. The commanders of these forces wear a modified berserker helmet with a large crest. At some point I noticed that the Uruk-Hai General’s helm has, as its base, the Berserker’s helmet. With a little modification I could have a new Orc helmet! I made a mold of my Berserker helmet and slush cast a resin copy. 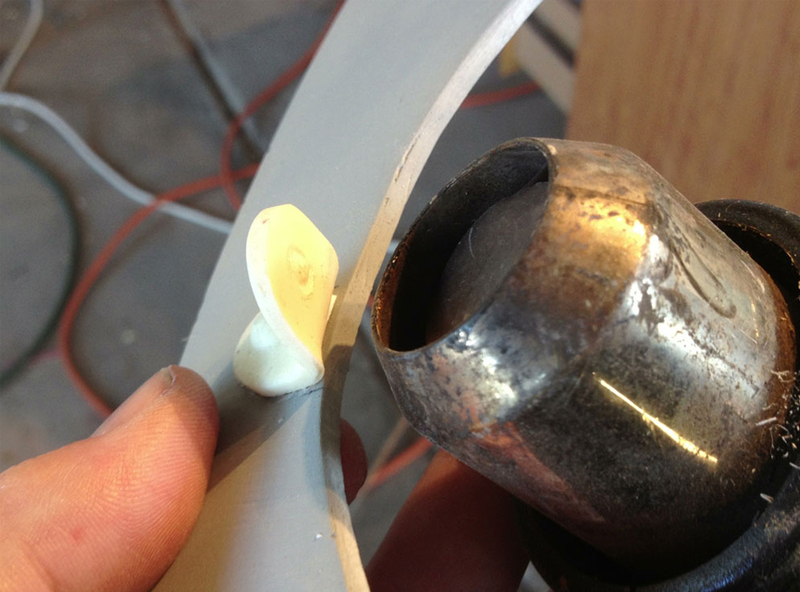 I cut a crest from thick (0.125″) styrene that fit over the helmet. To get a forged look, I softened spots with a heat gun and then pressed pits into the surface with a rough grit sanding sponge. I glued the flat side of the cast resin brackets I made (heat bent styrene and cast resin “rivets”) but the other side wasn’t sitting flush with the helmet’s surface. and then pressed it flat until it cooled. The General’s helmet has round, piggy eye holes so I needed to make inserts to convert the eyes. I heat formed some thick styrene and pressed it into each hole. 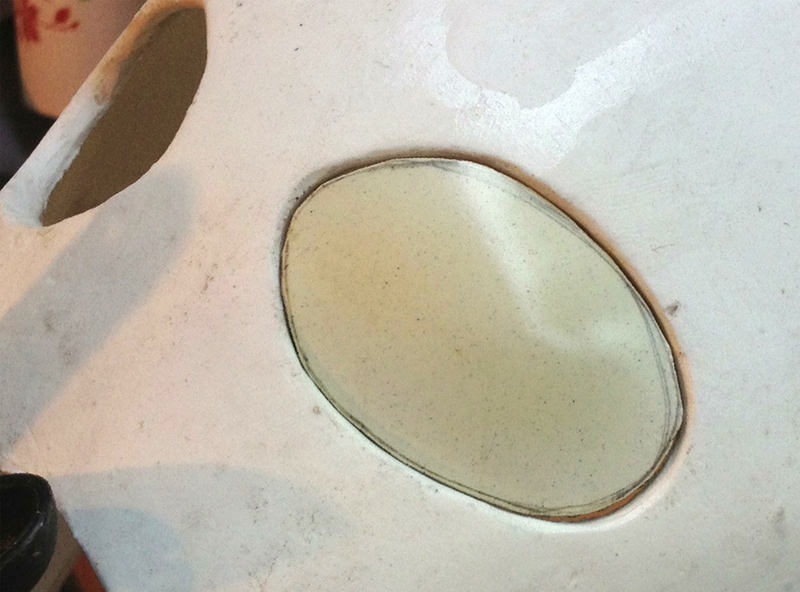 …and new eye holes were drilled in the insert. I made a mold of both inserts and cast resin copies. After glueing on some extra rivets across the forehead, I gave the helmet a base coat of Rustoleum Hammered Silver. A wash of black acrylic paint knocks back the shine, brings out detail and makes it much more realistic looking. 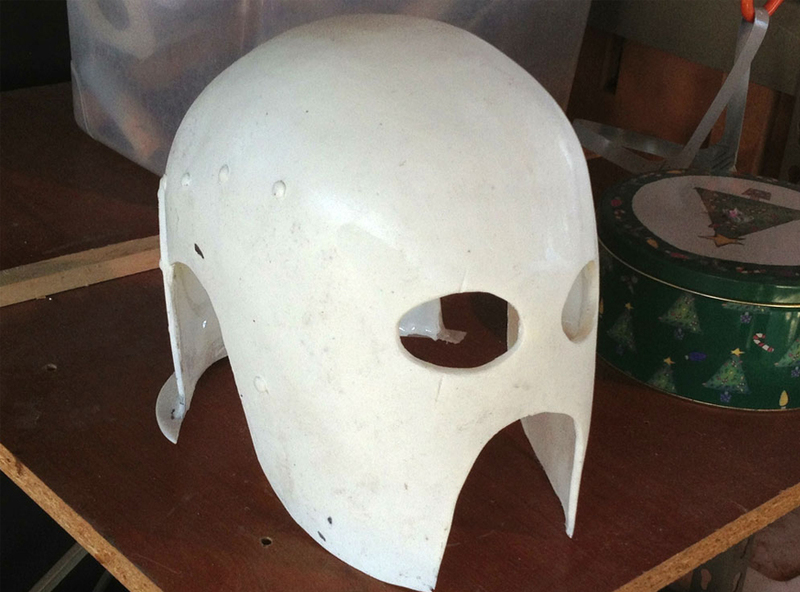 To make cheek guards, I cut thick styrene and heat formed it to fit snugly against the helmet. I made a mold of these pieces and then cast resin copies for the helmet. These were painted, weathered and then glued on. I added acrylic “rust” to areas that would collect water or parts where water might drip from. I had a thin area in the casting that I turned into a rusted-through spot rather than patching it with Bondo. Get a kit of this!